The Russian gas giant plans to invest over $38 billion to break into the highly lucrative Asian market. Gazprom is planning to invest more than $38 billion to build new production capacity in order to enter the fast-growing Asia-Pacific market. The company also plans to build a liquefied natural gas (LNG) plant in Vladivostok. The state-owned gas monopoly is keen on this substantial investment to gain a share in the burgeoning premium market of the Asia-Pacific Region, Gazprom CEO Alexey Miller said during a meeting with President Vladimir Putin this week. According to Miller, 770 billion roubles (about $24.6 billion) will be spent on the construction of a pipeline running from Eastern Siberia to Vladivostok. Most of the gas will come from the Chayandinskoye deposit in Yakutia, into which the group will invest about 430 billion roubles (about $13.7 billion), according to Reuters. Gazprom seeks to create a new export corridor for Eastern Siberian gas and build a LNG plant in Vladivostok that will produce 10–15 million tonnes of gas per year. “Markets in the Asia-Pacific region are above all markets for liquefied natural gas,” Miller noted, adding that the 220-billion-rouble plant will be launched in 2018. The main market for the plant will be Japan. “We will shortly be able to create a gas export capacity comparable to that of gas export to Europe,” he said. Russia's oil: Luck or curse? 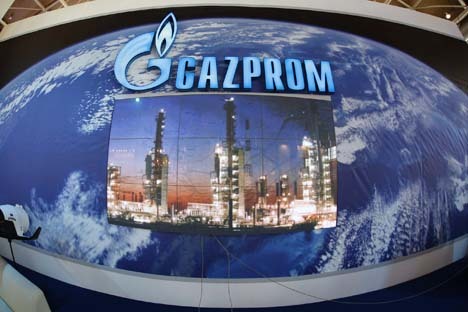 Gazprom exported 150 billion cubic metres of gas to Europe in 2011 and is planning to sell the same amount in 2012. The gas reserves at the Chayandinskoye oil and gas condensate deposit amount to 1.3 trillion cubic metres and recoverable oil and condensate reserves amount to 79.1 million tonnes. The 3200 kilometre gas pipeline is to be launched in 2017. Gazprom plans to Chayandinskoye first, followed by the Kovykta deposit in the Irkutsk Region. The company also plans a gas production centre in Krasnoyarsk in Siberia. This week, Vladimir Putin instructed Gazprom to complete negotiations on all key issues as soon as possible and to start the construction a Trans-Siberian pipeline to Vladivostok. However, he reminded Gazprom’s head that the gas from Chayandinskoye and Kovykta deposits should be used for internal consumption first, according to Interfax. “But considering that the reserves are huge – we have 3.5 trillion cubic metres there – another export centre oriented towards the Asia-Pacific Region can be set up,” President Putin was quoted as saying by Interfax. Gazprom is planning to implement its plan by building at least two pipelines. One will go west to the Tomsk Region, where it will link up with the Unified Gas Supply System. The other will go to Khabarovsk and then Vladivostok. “The possibility of the further supply of gas from the Irkutsk gas production centre towards Krasnoyarsk, Novosibirsk and Omsk in the west is also being considered. Thus we are planning to link Eastern and Western Siberia,” Miller said. Russia would then have a single nationwide gas supply system. Gazprom is to make the final investment decision before the end of the year. High taxes on mineral extraction are hindering the development of the Chayandinskoye deposit, as they make the project unprofitable. The company is hoping to get tax benefits from the Russian Government on the extraction of minerals, as well as on oil export duty. Government agencies are considering differentiating the tax on the gas extraction and there are grounds for thinking that the issue may be discussed at the Russian President’s state residence of Novo-Ogaryovo. Alexey Miller also reported on the progress of negotiations with China about a contract to supply Russian gas to the country. He said the APEC summit gave a new impetus to the talks. Asked by journalists about possible contracts, Miller explained that they would most probably be signed after 2018. “I would like to remind you that with China alone we have 68 billion cubic metres on the negotiating table; we are planning to export 10 billion cubic metres to Korea; and we have already delivered 18 billion cubic metres from Sakhalin. There is also the capacity we will create for deliveries to other countries, first of all Japan,” he said. However, Gazprom may face competition in Asia. The success of the Russian company is spurring authorities in Alaska to develop their own deposits, which are considered to be the biggest in North America. The Alaskan authorities are pinning their hopes for economic development on these deposits, the Alaska Dispatch writes. The Governor of Alaska, Sean Parnell, said that he was discussing the possibility of building a gas pipeline between Alaska and Asia with ExxonMobil, ConocoPhilips and BP. This project can only be implemented if there are significant tax cuts on the extraction of oil and gas. “Competition in the APEC gas market is fierce and Gazprom will have to compete with suppliers from Qatar, Malaysia, Indonesia and Australia to gain a market share in the region’s three biggest consumers, namely, India, Japan and South Korea. These four supplier countries have delivered about 110 billion cubic metres of gas in the form of LNG between them, while Gazprom has delivered 14 billion cubic metres. However, considering the problems Gazprom is experiencing in Europe – its main market – diversification of export destinations makes sense,” the co-director of Investcafe analytical department, Grigory Birg, told Vzglyad.